Dr. Wheeler and his research group are working to improve the performance of electrochemical systems and processes through understanding microscale and molecular behavior and mechanisms. Below is a list of current research areas. Additional details are available in our publications. Lithium-ion batteries are great energy storage devices. This is why they are used ubiquitously in mobile phones and laptop computers. However, there are a number of challenges to adapting these batteries for use in hybrid- and fully-electric vehicles. In particular, we need a cheap, abuse-tolerant, and long-life battery stack that can generate a large amount of specific power. Our work in this area is to engineer improved electrode morphologies in order to promote battery power and life. In addition, we perform experiments and computer simulations in order to obtain ionic and electronic transport properties in battery components. This work is supported by the U.S. Department of Energy through the BMR program. 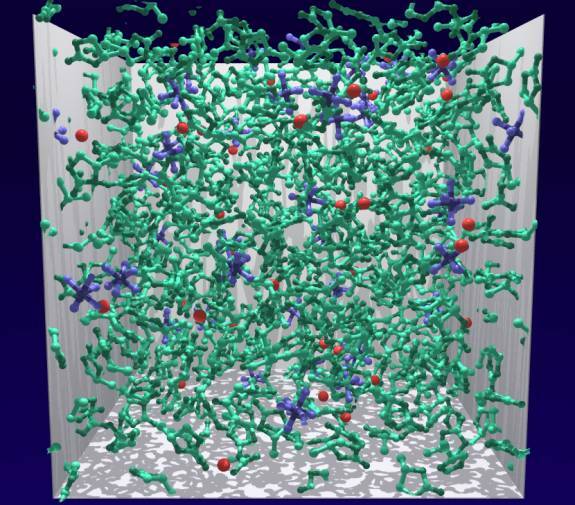 The group has especial expertise in performing molecular-scale and mesoscale computer simulations, such as molecular dynamics, to elucidate the connections between microscopic and macroscopic behavior--that is, how the interactions of molecules or particles influence thermodynamic and transport properties of materials. The simulations serve as a means of estimating or predicting properties when experimental data is difficult to obtain. In adapting molecular simulations to the investigation of particular systems, we have developed new algorithms that can be helpful to other researchers. These include accurate treatment of polarizable metal surfaces, simulating multicomponent mass transport, dealing with covalent bond making and breaking, more efficient ways to handle Coulombic interactions through the Ewald Sum, and dealing with a slurry-to-solid drying transition for battery materials. Below is shown a configuration snapshot from a molecular dynamics simulation of 1 molar LiPF6 in propylene carbonate solvent, an electrolyte used in lithium batteries. The red balls are lithium ions, the blue “jacks” are PF6- anions.